Putting your money into foreign stocks is like vacationing in other countries: The lure is intriguing, but where you go and how you go about it make all the difference. Most people like foreign travel. And why not? It broadens your perspective. You see things you’ll never see in the U.S. You’re exposed to different people and different cultures. After all, there’s only one place to stroll the Champs d’Elysee on a beautiful summer day. If you want to see masterpieces by Goya and El Greco, you’ll visit the Prado Museum. The glory of imperial Russia lives on in St. Petersburg. Only on the Sydney harbor does the famed Opera House unfurl its concrete sails. Every visitor wonders about the secrets locked in the ancient stones of the lost city of the Incas, Machu Picchu. Peter had the good fortune of seeing several foreign countries “up close and personal” because he lived and worked abroad for several years. He began my career in corporate finance in Europe and traveled not only throughout Europe but also the Middle East, Asia and Latin America. For all the pleasures of traveling the world’s highways and byways, we’ll bet you plan your trip with great care. (We know Peter always did when he lived abroad and still does today even though he lives in New Jersey.) It’s helpful to consult others, whether a knowledgeable travel agent or friend who has been where you’re planning to go — or both. Fact is, a well thought-out itinerary can make or break your trip. And, as we all know, not all the world is so welcoming. You’d go to Milan, for example, but probably not to Mogadishu. First and foremost, we believe in having exposure to international economies. The primary rationale for investing in international stocks is 1) portfolio diversification and 2) the potential for higher returns. We agree. However, we depart from conventional wisdom in the way in which we invest abroad. We prefer to provide our clients with exposure to foreign economies by investing in U.S. multinational corporations listed on U.S. exchanges and in the American Depository Receipts (ADRs) of companies that are domiciled abroad but whose shares trade on U.S. exchanges. This approach differs from many other advisors’ strategies. Specialists in international investing who buy stocks argue that one has to invest in foreign companies whose shares are traded on foreign exchanges — not in the U.S. This is the only way to realize the diversification benefit, they say. We believe the direct investing argument overlooks the risks involved in international investing using equities — and there are several to be considered, including one that we will cite based on Peter’s own personal experiences abroad. One is currency risk. International stocks trade in euros, yen, yuan, pesos, etc. When returns are brought back to this country for the account of a U.S. investor, the foreign currency needs to be converted to U.S. dollars. On that basis, local market returns can go up or down, depending on whether the dollar is stronger or weaker than the local currency. When the dollar is weaker, foreign market returns get a boost. That’s because, taking the euro as an example, the currency is strong and it buys more dollars, magnifying returns for U.S. investors. But during protracted periods of dollar strength, lower returns will result from international investments. U.S. multinational companies can hedge foreign currencies to the U.S. dollar and thus reduce some of the risk to which U.S. citizens investing in foreign companies are ordinarily exposed. Another consideration is political risk. We have only to go back to September 2006 for an example. That’s when Thailand’s government was replaced in a bloodless coup. In January, the Bank of Thailand announced capital control measures for foreign investments. Result: an instant 15 percent sell-off. When Venezuelan President Hugo Chávez nationalized the large telecommunications carrier in his country, CANTV, whose controlling stake is owned by Verizon Communications, CANTV shares fell about 30 percent in a matter of weeks; Verizon shares trading in the U.S. were relatively unaffected because of the company’s enormous size and diversified business. Country risk refers to risks that are specific to certain countries. A hypothetical example would be an environment in which European economies are strong, but for various reasons the U.K. is weak. In that situation, investments in continental Europe would generally perform relatively well, while those in the U.K. would be more likely to lag. Country risk can also refer to risks relative to a specific country’s political system, economic structure, currency, sovereign debt, banking sector and other factors. Liquidity risk exists in many places because the stock markets are so small and thinly traded. Even in some developed countries — Scandinavian countries, for example — total stock market capitalization and the number of issues traded mean the markets are not sufficiently diversified. As a result, the fortunes of one or two companies can greatly sway market returns in the entire country. A good example is the Helsinki Stock Exchange in Finland. For years, one company — Nokia — accounted for about half of that exchange’s entire capitalization. Market returns in Finland were tied to one company’s fortunes. If we liked Nokia, we’d simply invest in Nokia ADRs. There are also risks in legal systems and business codes — or the lack thereof in many countries. In the U.S., the rule of law prevails. The securities industry is highly regulated. Auditing standards are high — and even higher since the 2002 passage of the Sarbanes-Oxley Act. And, not to be overlooked, there is a free press. Investors do not have these assurances in many other countries. In addition, practices that are considered unethical — and/or illegal — in the U.S. find their way into too many business transactions overseas. Recalling those earlier years in Peter’s career, while working in Europe he was exposed to business dealings there as well as in the Middle East, Asia and Latin America. It wasn’t unusual to find evidence of practices that were “shady” at best — things you want to stay as far from as possible. He’s referring to bribes, intellectual property piracy, racist practices and thinly veiled pay-offs. We also question the degree to which some foreign companies live up to their social responsibilities because, for instance, they are polluters, facilitate money laundering or operate plants under sweatshop conditions. Liquidity risk exists in many places because the stock markets are so small and thinly traded…the fortunes of one or two companies can greatly sway market returns in the entire country. Before leaving this discussion of risks, we shouldn’t overlook tax risk. Investing in foreign entities can significantly complicate one’s tax situation. There can be issues ranging from treatment of capital gains to foreign withholding that take time and expertise to understand and treat properly on a tax return. We saved the best for last. Remember, we said that we are proponents of international investing — but that we simply approach it differently. If all these risks exist, why would we risk investing internationally? Remember, as well, we said we invest in multinational U.S. companies and foreign companies whose shares trade on U.S. exchanges. That produces the balance of risk and reward we’re looking for. Does this give us effective exposure abroad? For a broader sample, we would point out that both The New York Times and The Wall Street Journal have reliably reported that non-financial companies in the S&P 500 Index currently derive an average of more than 40 percent of their revenues from foreign operations. Moreover, we would point out that these companies have the resources to hire and retain the best and brightest foreign nationals in the countries where they operate. In other words, they aren’t making business decisions impacting foreign markets from the U.S. They have administrative, sales, engineering, manufacturing and service operations the world over. They are truly global companies. As for foreign companies trading in the U.S., they have to meet the listing standards of our exchanges, adhere to our accounting and auditing practices, and file complete and accurate financial reports. Investing is all about weighing risk and reward. There are plenty of good companies domiciled abroad and in my experience working overseas I saw a lot of very fine management talent. It’s just that over time the risks of investing in foreign domiciled companies outweigh the potential rewards. And, you can get plenty of foreign exposure by investing in quality multinational companies listed on U.S. exchanges. 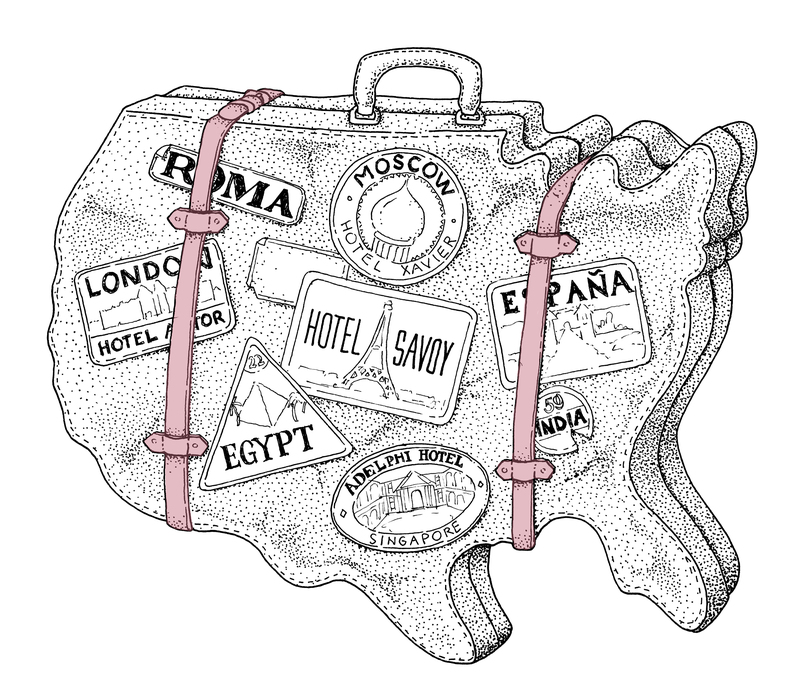 You do the same when you travel abroad — weigh the risks and rewards. No matter how intriguing a destination may be, if it entails enough risk you’ll likely decide to vacation elsewhere — and be just as happy. International Investing is just one of a host of topics McRae Capital can help you understand, like the risks of market volatility, how to live off retirement savings, and why taking the long view as an investor is so very important.